This side receiver mount allows the user to use both standard sling webbing and hook style sling attachments. The Multi-Use Receiver End Plate Sling Adapter For Collapsible Stocks (MURP) will accept up to 1 1/4 inch webbing for traditional sling attachments, and has a special annular feature that allows those slings with hook type attachments to be used without having to change out the receiver end plate sling adapter. 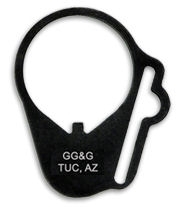 As with all GG&G Receiver End Plate Sling Adapters, this sling mount is designed for professional use being machined from AS-35 Geneva steel. Of exceptionally high quality, this famous Swiss steel features molecular structure with elongated grains for added toughness. It has a manganese phosphate matte black finish per mil-spec. This collapsible stock side sling adapter can easily be installed by the operator.